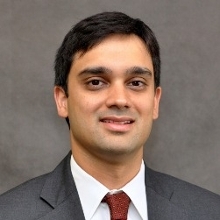 Cardiothoracic surgeon-researcher Manu Sancheti, MD, received the Best Scientific Poster Presentation Award at the American College of Surgeons for a study of cancer mortality risk factors for lung cancer patients after surgical resection. Sancheti led a team of investigators from the Emory University School of Medicine in a review of data from the National Cancer Data Base of the American College of Surgeons and the American Cancer Society on more than 215,000 patients who had surgical resection for lung cancer during the period from 2003-2011. Team members included Kristin Higgins, MD, Suresh Ramalingam, MD, Felix Fernandez MD, Theresa Gillespie PhD, Dana Nickleach MA, Yuan Liu PhD and Joseph Lipscomb PhD. Although several hundred research posters from around the world were submitted to the College's Clinical Congress, only 10 were selected as Posters of Exceptional Merit, and Sancheti's team earned the top honor. "There is a great deal of literature previously published that describe clinical factors that affect short-term mortality in patients after lung cancer resection. In this study, we analyzed non-clinical factors that may affect a patient's outcome after surgery and therefore identify possible disparities in care." says Sancheti. According to Sancheti, the team looked specifically at socioeconomic variables and how these factors affected patients' short term mortality. "We discovered that uninsured patients living in a less-educated area and a lower median income had a higher 30-day mortality risk after lung cancer resection." he added. The researchers also discovered that patients who underwent their procedure in an academic facility had a lower risk of short term mortality after lung cancer resection. This study is the largest database analysis of short-term mortality in patients undergoing surgical resection for lung cancer to date. Sancheti earned his medical degree from the University of Alabama School of Medicine. He completed his General Surgery internship and residency at St. Luke's-Roosevelt Hospital Center in New York, NY, followed by a Thoracic Surgery fellowship at Emory University. Sancheti's areas of clinical interest are esophageal and lung cancer, lung transplant and minimally-invasive and robotic thoracic surgery. He joined Emory Cardiothoracic Surgery at Emory Saint Joseph's in 2014 and is an Assistant Professor of Surgery at the Emory University School of Medicine.